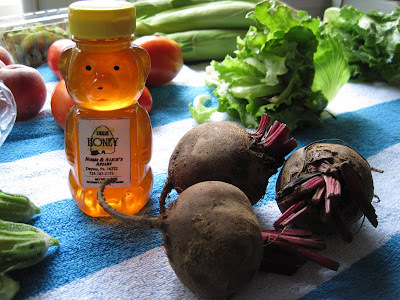 Week #17 brings us cinnamon basil, corn, plum tomatoes, peaches, hot hungarian wax or semi-hot peppers, red beets, squash blossoms, lettuce, honey, and edamame. 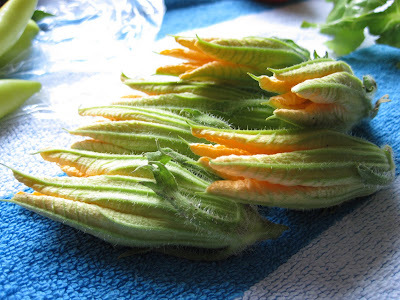 Last year we stuffed our squash blossoms with ricotta, dredged them in flour, and sauteed them in oil. Not sure what we'll do this year, but we should eat them soon and we don't have any ricotta so I guess we'll be trying something new with them. 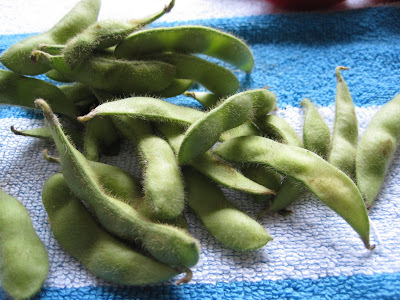 Fuzzy edamame: Googer says the fuzz disappears after the edamame is boiled.